Download the full Wikibook in PDF. Download the full Wikibook in EPUB (learn more). Buy this Wikibook and get it by mail. Customize: take what you need, leave the rest (learn more). 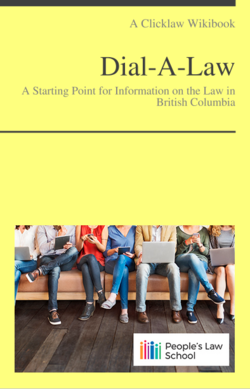 Dial-A-Law features free information on the law in British Columbia in over 130 topic areas. A service of People's Law School, Dial-A-Law is available on Clicklaw Wikibooks, a dedicated website at dialalaw.ca, and on the telephone at 1-800-565-5297. Dial-A-Law © People’s Law School is, except for the images, made available under a Creative Commons Attribution-NonCommercial-ShareAlike 4.0 International Licence. At People's Law School, we believe accurate, plain English information can help people take action to work out their legal problems. This information explains in a general way the law that applies in British Columbia. It is not intended as legal advice. For help with a specific legal problem, contact a legal professional. Some sources of legal help are highlighted in the page on free and low-cost legal help. People's Law School is a non-profit society in British Columbia providing free education and information on the legal problems of daily life. See more titles from People's Law School.